River Valley’s Caterina Gattinara (10) goes up for a block along with teammate Rayanna Adkins during the Lady Raiders’ Division II sectional semifinal volleyball match against Unioto on Wednesday in Chillicothe, Ohio. CHILLICOTHE, Ohio — In what was their final tilt in a season of struggle, the River Valley High School volleyball squad perhaps played their best single set of the entire year. 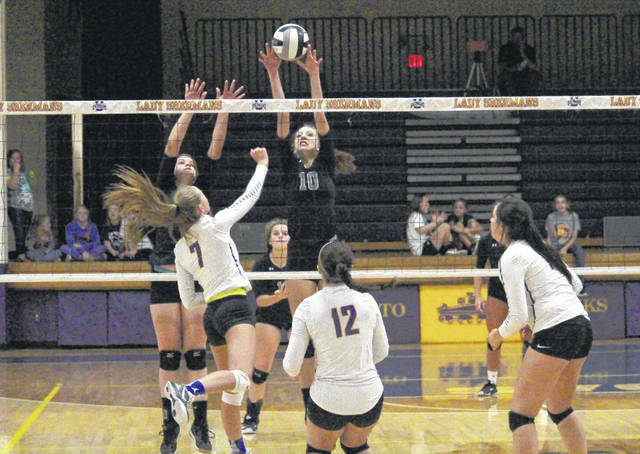 Nevertheless, the Lady Raiders — an overwhelming underdog at Unioto on Wednesday — fell to the top-seeded Shermans in the Division II sectional semifinals, getting swept 25-8, 25-22 and 25-9. With the loss, River Valley — despite eight seniors and an impactful foreign exchange student from Italy —ended the season at 5-18, with wins only over South Gallia twice and Belpre, Vinton County and Ohio Valley Christian School once. But, only OVCS had at least eight victories — and is not a member of the Ohio High School Athletic Association. Still, the Lady Raiders — moving up to OHSAA Division II for the first time — nearly knocked off Unioto in the second game, playing as well as it has all season. In fact, River Valley led by as much as 5-1, scoring the opening four points on three Sherman errors — and a pair of kills by middle hitter Carly Gilmore. While the tall, talented and highly-touted Shermans scored seven straight points to take an 8-5 advantage, the Raiders — following a 5-5 tie —kept the game deadlocked at 9-9, 10-10, 12-12 and 13-13, and remained within a point at 14-13, 16-15 and 17-16. Unioto held four four-point leads at 20-16, 21-17, 22-18 and 23-19, but Gilmore — who amassed eight kills in her final match —managed two more to get within 23-21. But the Shermans finished off the Raiders with a blocking error and finally another kill. It may have come too little too late, but first-year RVHS coach Brent Smith said the gritty performance and effort in the second game was what River Valley could have been in 2017. The Raiders started the season at 2-1, but suffered through 12 consecutive losses before the OVCS win. They then lost three more in a row before back-to-back victories over Vinton County and South Gallia. The Shermans, meanwhile, went undefeated at 14-0 in winning the Scioto Valley Conference for the first time —part of 21-1 with their only loss to defending Division II district champion Logan Elm. Aside from that second game, however, Unioto rolled as expected, trailing only 2-1 in the opening game while never trailing in the last. River Valley’s only points in the opening game —aside from four Unioto errors —were kills by Gilmore, Caterina Gattinara, Kasey Birchfield and Kelsey Brown. In the third set, Gilmore, Gattinara, Madison Tabor and Rayanna Adkins all had kills —as Gattinara served up an ace. Another four Sherman mistakes gave the Lady Raiders their other four points. An attack error and Gilmore’s final career kill made it 5-2 in the third, but a Sherman sideout — followed by eight straight service points by Ashley Taylor including four aces — upped the advantage to 14-2 and the rout was on. The Raiders recorded 20 kills out of 49 attacks in play, as Gattinara and Tabor tallied three apiece along with two apiece by Adkins and Jaden Neal. Neal, with a serve straight off the net in game two, notched the club’s only other ace. Gilmore garnered both blocks, while RVHS also amounted 26 digs and 16 assists. Jocie Fisher finished with 11 kills, seven digs, three aces and two blocks to pace the Shermans, as Taylor tacked on nine kills. Both she and Hannah Hall had four aces apiece, part of a team 11, while Madi Eberst set for 27 assists. In the first game, Hall had a kill to double the lead to 14-7, as Fisher then served for 10 points in a row en route to the 25-8 win. The match marked the final for eight River Valley seniors — Gilmore, Adkins, Tabor, Neal, Rachel Horner, setters Isabella Mershon and Jessica Roush, and reserve Jessica Burke. Gattinara is the foreign exchange student, who will return home at the end of the school year.